As presented on my blog "pages" you see that I make jewellery. Whenever I am preparing for a big sale, I spend a lot of time searching for the jewellery trends of the time. I then stare at my stash of "stuff" and allow creativity to flow. For this post, I summarized the features from what I have seen online, in fashion magazines and in the stores while in France in October and in Canada presently. Keeping these features in mind, I design, assemble, take apart, put back together, ponder about and eventually design pieces with which I am happy. Length: It appears as if lengths range from the "choker" to the long "flapper-style" and everything in between. Whether on the catwalk or on the DIY videos, every length is represented. In the business of preparing for a sale, I now feel that I have to have a representation of each. Colour: As in all winters previous and all winters to come, deeper colours appear on the forefront. Emeralds and deep greens are popular this particular season. I've seen a lot of sapphire blue and red along with tones in turquoise and coral/orange. Of the metals, gold seems to predominate. But in fact, I would suggest that you choose the metal tone that feels and looks good against your skin. Stringing Materials: A"new" recurring feature in the forefront this season is the ropey silk cords, waxed cotton, leather lacing and other woven cording. Of course, there are always pendants strung on cords every season but this winter, there appear to be more. In some cases, thick cording and the knotting is as much the feature as the pendant or charms. And yes, there are chains in multiples as well. There usually isn't just one style of chain holding the beads but rather many thicknesses of many chains looped in varying lengths. Then there are those pieces with the combination of cord and metal. It seems that metal hoops and fabric loops are being featured alone or in combination. Beads, Charms, Pendants, Tassels and Other Decorative Embellishments: Stones such as turquoise, onyx, different colours of quartz and really just about any kind of stone appear in the collections and reflect that sought after "tribal" quality. Art deco and tassels, reminiscent of the "flapper style" balance the natural and fabric cording materials. Crosses, in decorative Gothic style, as well as in matching colours are yet another prominent feature. But then again you can find what you are partial to, whether it be hearts or skulls. Size: Big! Pendants are big, tassels are long and small elements are gathered to evoke "bigness". Materials + Features = Product: Put it all together and you get the statement necklace which tops the lists as the predominant trend seen online and in print for the winter of 2012-13. Oversized earrings, with chandelier styles still in vogue, and multiple bracelets, beaded or cuffed, recur featuring the components listed. What's the trend in your part of the world for the winter of 2012-13? WOW! Is there anything you don't do? That necklace looks so nice against that white back ground. What is that white stuff. 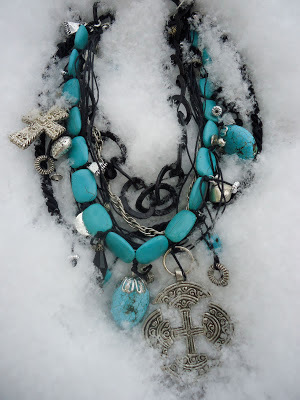 :) Beautiful necklace and Great post! Thank you. I'm enjoying designing these "statement" pieces. Presently, I'm working on one with coral and silver. Regarding your "white stuff" comment: I once had an African student, who when he experienced snow for the first time, said, "What is that white stuff falling from heaven?" Yes, indeed, what is that white stuff? Too much of it, too soon this year! Your designing skills are amazing. I wish I had someone I could buy some of your art for. As for the white stuff, sorry to rub it in since I'm not enJOYDing any of that right now. Haha. Let me enjoy my sunshine now cuz reality will show it's ugly face again soon. Speaking of white stuff, today is Black Friday here. Guess what I bought! Actually I bought them on Wednesday at BF prices. I pick them up tomorrow after the BF insanity has ended. Funny you should use the word, "art". I had one person buy a necklace and she told me she hadn't worn it yet but had it displayed as sculpture in her home. Hmmm? I really wish she would wear it. But of course, enjoy every moment in the sunshine and your new purchase. Send me a photo and I'll update the ballet flat post! Check out the updated ballet flat post with a photo of your magenta Tory Burch pair, nice contrast to the black - a style evolution manifesting.